This dish is easy to do if you have a sous-vide, or take a look at my sous-vide short cuts to make your own water bath for cheap. A pair of duck legs, free range, organic, best you can buy. 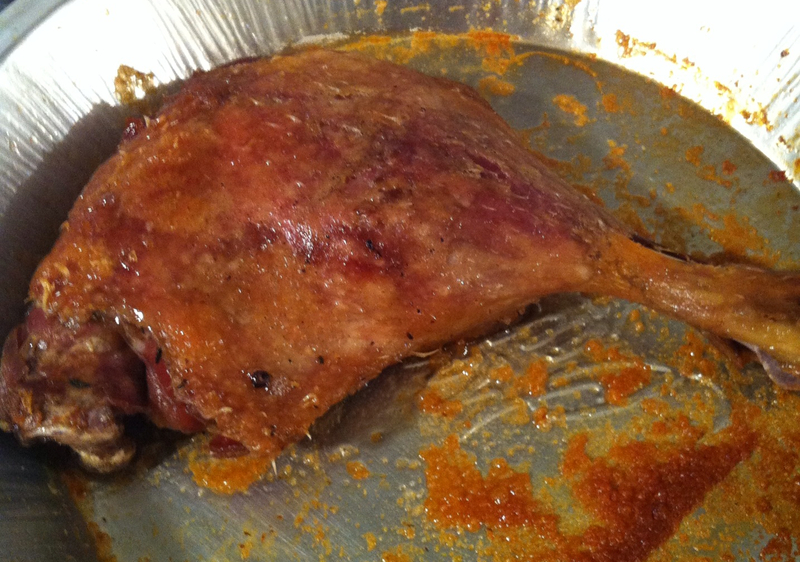 Add brine ingredients to 1 liter of water, and brine duck legs for 6 hours. Preheat Sous Vide to 80 C or 176 F.
Remove legs, rinse well, pat dry and season with salt and pepper. Add to Sous Vide bag with oil/fat. Seal. Sous Vide for 8-10 hours (max! more than this and texture will be much too soft). Remove and cool in ice water and hold until needed in fridge (up to 3 weeks or more). For serving, broil under high heat until skin is brown and crisp. Depending on what you want to use it for, meat can be removed for salads, or heat-pressed (put in-between 2 pans and put on the stove) to increase crispiness, or simply serve whole.